The NEW SX80 PULSAR machine completes the range of the SARIX Micro EDM Machines bringing effective cost reduction on the conventional hole drilling requirements. • The capacity of the SX80 PULSAR machine complete the range of the SARIX machines and brings effective cost reduction on the conventional hole drilling issues. 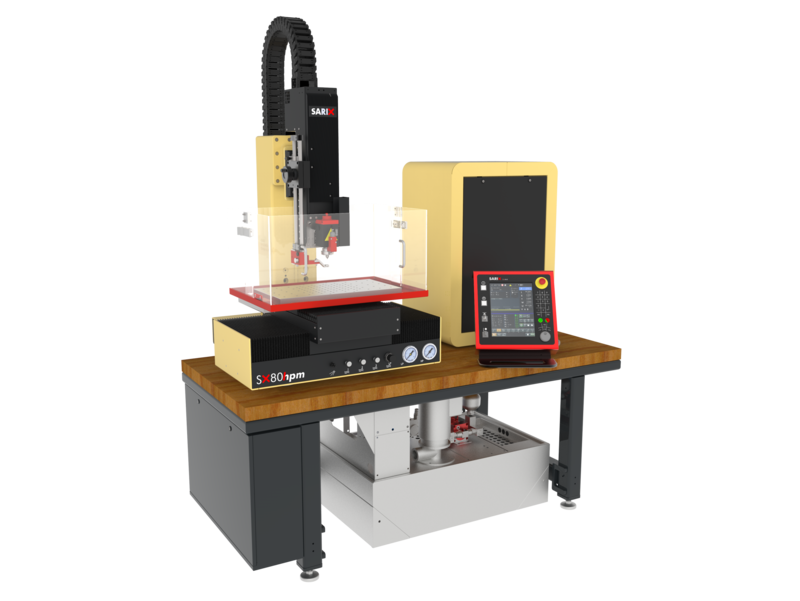 • The simple SX-CNC allows with several options the evolution of the machine configuration up to multi-axis motion. • “High production concept” for complex drilling tasks through efficient multiple hole drilling sequences and multi-layer drilling. • SX-HMI, “On-board”, easy and user friendly unlimited programming and editing software, direct drilling macros, “on board” self-learning drilling technology. • Generator SX-MPS PULSAR , high performance SARIX Micro Pulse Shape EDM , with its associated Technology opens up new opportunities for faster, deeper, smaller and also precise holes. • Micro EDMing drilling technology with solid and tube electrode from 45 Microns to 3.0 mm. • Micro Holes, high Precision Micro holes and shape holes down to 20 Microns with Electrode Wire Shaping device (*). • High surface finishing capability down to Ra 0.1 and Ra 0.05 with the Micro Fine Pulse Shape generator SX-MFPS (*). • Automatic axis positioning control with hole depth control. • High precision Automatic electrode refeeding spindle with dielectric through flushing for continuous production (*). • High Speed Micro EDM drilling Technology with breakthrough-detection device (*).